When voters went to the polls for the 2007 assembly election, they still didn't know for sure if the DUP and Sinn Fein would share power or if the Stormont Executive would have any more of a prolonged lifespan than the stop-start administrations which preceded it. The relative stability of the past four years, and the party's achievement in overcoming the hurdles concerning the devolution of justice, led to the expectation that this would be the first campaign to be dominated by the so-called "bread and butter" issues, such as the economy, health and education. The Stormont parties have tried to respond to this agenda, attending hustings events and setting out their views on issues like tuition fees and water charges. But dissident republicans, who are not standing candidates for the assembly, have forced security concerns back up the agenda with a series of threats, bomb alerts and, most tragically, the murder of 25-year-old police officer Ronan Kerr. The dignified appeal by Constable Kerr's family for people to vote in order to demonstrate their support for peace may resonate with many voters. However, turnout remains a concern, partly because of a long-term decline in voting patterns, especially in the east of Northern Ireland. In addition the Stormont system, which creates a coalition between all the major parties, makes it virtually impossible for voters to eject a government and install an opposition. So the dynamics which came in to play in the recent Irish election do not apply. Observers will be watching to see if this is the first assembly election in which turnout falls below 60%. During the campaign, differences in emphasis emerged between the major parties. Sinn Fein and the DUP accused the two smaller unionist and nationalist parties of not being "team players". The SDLP and Ulster Unionists retorted that the big two parties had too cosy a relationship and carved up all the power between them at Stormont. The Alliance appeared to side with the big two, who put them into their position at the justice department. Sinn Fein and the DUP both ruled out tuition fees and water charges. The DUP established itself as a "low-tax party". Despite its criticism of Chancellor George Osborne's spending review, with its £4bn in cuts, the party maintains the executive should not charge taxpayers more when there's scope for further savings in government. Alliance was the only party to back water charges, a position which may have been honest but left the party open to attack from others. The Ulster Unionists defended their handling of health, criticising the other parties for not giving the key department a better deal. 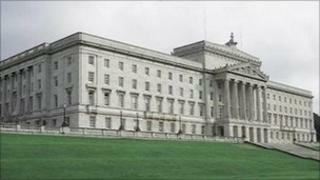 The DUP and Sinn Fein insist that it's "Conservative/Ulster Unionist" cuts that are to blame. They both scored points against the UUP over the decision not to press ahead with the Altnagelvin radio therapy centre in Londonderry. Despite the clashes between the main Stormont parties, the wider policy differences remain between the big parties and those on the fringes. The five executive parties all back a cut in the local level of corporation tax to match (or better) the rate offered to businesses in the Irish Republic. This is currently the subject of a Treasury consultation. However the smaller left-wing parties in the contest echo the concerns of the trade unions that this would amount to a tax break for business at the expense of a £300m cut to Stormont's block grant, which will means cuts in services. The Greens also oppose a tax cut for big business, arguing that more rates relief can be provided for those who make smaller profits. The Traditional Unionists line up with the sceptics on corporation tax, criticising it as a risky experiment. The TUV's concerns are political as well as economic, as they fear the harmonisation of tax rates on a north-south basis could be the thin end of a wedge towards an all-Ireland tax policy. The TUV have used the campaign to reiterate their criticisms of the Stormont system, likening it to North Korea because it's practically impossible to eject a government and install an opposition. Whilst the politicians debated the "bread and butter" issues at various hustings events, few are under any illusions that traditional 'orange/green' voting patterns will shift in any radical fashion. The DUP looks likely to remain the biggest party, with Peter Robinson mounting a comeback from his defeat in last year's Westminster election. So interest may focus on the relative ranking of the Ulster Unionists and the SDLP and whether Alliance can build on last year's success, when they toppled Mr Robinson in East Belfast. Any changes are more likely to be the product of boundary shifts rather than voters' detailed scrutiny of the party's policy positions. However, observers will scrutinise how voters distribute their lower preferences for any evidence to suggest whether voting habits may begin to shift in the future.